Whether you have a tiny apartment balcony, a weathered urban stoop, or a broad, wrap-around deck, container gardening is a great way to be creative and experiment with new plants and designs. The possibilities and combinations are endless, and each gardener has a unique style and vision. 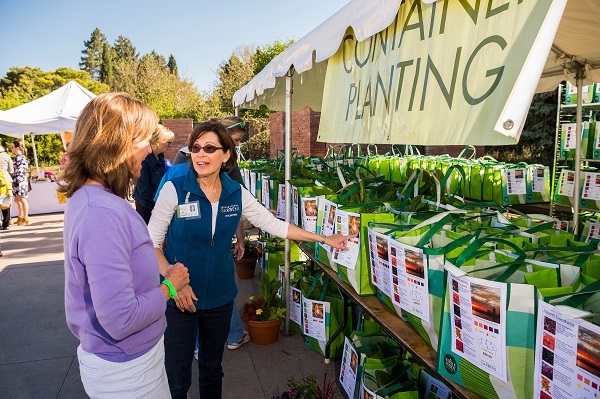 At our annual Spring Plant Sale, our horticulturists in the Container Garden in a Bag division have assembled six stunning collections of plants designed to create beautiful container gardens on your porch or balcony. Or, if you’d rather design one yourself, they’ve put together some guiding principles to guarantee a successful container garden. The type of container you use, and the area where it will be placed, should be considered to make sure your container garden will thrive. Choose a well-thought-out and hospitable location for your container. Factor in the paint color and lighting on your patio or balcony. Choose plants that complement or contrast with your container so the colors of both are highlighted. A well-designed container usually includes three kinds of plants: thrillers, fillers, and spillers. Thrillers are showy, ornamental plants that act as the focal points of the container and usually have interesting flowers or foliage. Fillers tend to grow bushy and fill in empty spaces in the container, typically with showy flowers or foliage, but not in a way that distracts from the thriller. Spillers have hanging or trailing growth habits that can cascade out of the sides of the container, softening its appearance and making it look more natural. A good container showcases plants that have similar growth requirements. Light, water, and fertilizer needs should match fairly closely for all the plants in your container. Choose plants with heights appropriate for the container you are planting in. Low maintenance plants will be your friends! A quality fertilizer, used regularly throughout the growing season. Organic fertilizers are ideal as they do not burn the roots of the plants as easily as chemical fertilizers. But most importantly? Be creative and express yourself! Experiment with new plant or color combinations to personalize your garden and make it unique from any other. Stop by the Container Garden in a Bag division in Oak Grove for more expert advice on creating a container garden you’ll enjoy all summer long. Admission to Spring Plant Sale and the Gardens is free on Friday, May 11 from 8 a.m. - 6 p.m. and on Saturday, May 12 from 8 a.m. - 5 p.m. Get here early to get the best pick of the plants, and don’t forget to bring a wagon to haul them around! Here is more information about Spring Plant Sale. The Plant Sale Preview Party on May 10 is SOLD OUT.